Hi Christine, how come we don't need baking powder for this cake? Is it because it is a chiffon cake? Thank you. For chiffon cakes, we only need the egg whites. May I know where did u get the Chiffon 蛋糕模? Cos I also live in Australia, Perth, but i could not find this type of baking tray in stores. Thanks. The chiffon mould was bought from HK. But you can get one from any kitchen shop in Australia, like Robins Kitchen. They offer many good quality bakery things, more expensive than those in HK of course. Check their website to see if they have any branches in Perth. You can explore any other kitchen shops around your suburb. 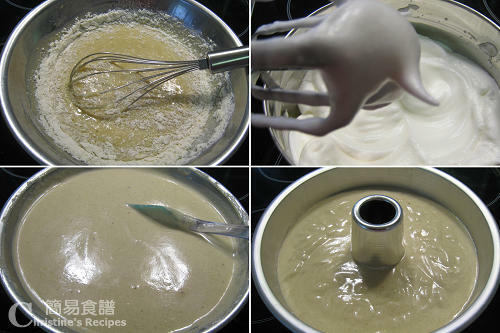 低筋粉 is cake flour. You can get it from any supermarkets or Asian stores. Hi if I dont have cream of tartar, what else best can be replace with? whipped cream possible? Cream of tartar is an acid salt that stabilizes and gives more volume to beaten egg whites. 之後再嘗試焗其他蛋糕, 例如:香橙等等的蛋糕也有出現脫模的情況! thank you so much! i really wanna make this cake again, last night the result wasn't so good cuz i think i messed up on the oil and milk....could u tell me how to calculate g to ml or oz? Sorry for late reply. Just measured the ingredients for you. May I skip sugar in beating the egg white as I am diabetic? Thanks a lot! I'm afraid that it won't work if skipping the sugar, as the sugar is very important in making the egg whites stiff. I've tried and bake this cake, but not success. it turns out not fluffy at all. - can't find any cake flour and all-purpose flour in UK, so i used plain flour instead. - don't have chiffon cake mould, so i used normal cake tin. let the cake cool down completely inside the cake tin before take it out. - your recipe has mentioned salt on the ingredient part but not on the steps, when i shall add the salt in? Really hope i can hear from you soon. As I'm really frustrated here. I have baked the Japanese cheese cake three times, but not success. then tried this banana chiffon cake and still no joy. I really don't know what else i could do to bake this kind of cake successfully!!! Please help here. Hope to hear from you soon. Thanks very much in advance. All purpose flour is not the best for making chiffon cakes as the texture would not be soft enough. The beaten egg whites are the important element to make the cake fluffy. I have posted two videos of how to beat egg whites and how to fold-in the egg whites on YouTube. The links to my videos are on the right side bar on this blog. Hope they help. 但我是用Baking powder, 唔係用tart tart cream的. 但呢2次用tart tart cream 就個cake 發唔到, 請問知道點解嗎? When should I add salt?? Oh, thanks for asking. Add the salt together with the flour. Updated the post. I just made the cake tonight and it looked kind of different from yours. Here are some of the pictures. Problem 1: My banana cake doesn't 升高 like yours. Problem 2: It doesn't look as dark as yours. Problem 3: Is the inside supposed to look like mine? I can see your chiffon cake shrinking back. Was the air inside knocked out while folding-in the egg whites? Looks like that you used a non-stick cake pan. Am I right? Chiffon cakes in a non-stick cake tin tend to shrink back once it cools down. Yea, I used non-stick pan. What kind of pan should I get?? I really want my cake to look good like yours =) By the way, how does the inside of your cake looks like?? Is it supposed to look like the one on my pictures?? Please take a look at the pictures on this post. 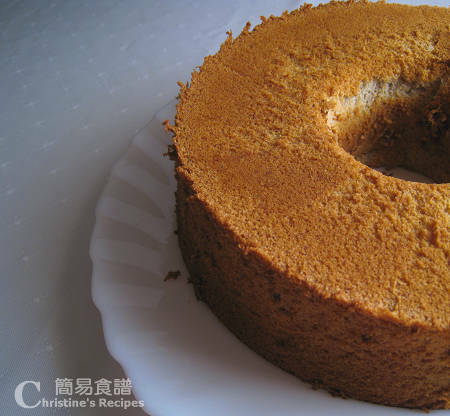 I often use this kind of chiffon cake tube pan, very good to make high and fluffy chiffon cakes. Seems that the inside of your cake was quite alright, just had shrinking problem. Hi Christian, thanks for your receipe they are all very nice! For making this cake, I used oven bake. If you'd like to use fan-forced bake, you have to reduce 20C/70F, compared with the oven bake. The temperature of fan-forced bake mode is higher.